dPS is at it again. In two separate posts, they’ve outlined ten elements of composition in photography. Instead of looking at composition as a set of ‘rules’ to follow – I view it as a set of ingredients that can be taken out of the pantry at any point and used to make a great ‘meal’ (photograph). Alternatively I’ve often described it as a set of ‘tools’ that can be taken out of one’s compositional tool belt at any given time in the construction of a great image. In the first post you will learn about pattern, symmetry, texture, depth of field, and lines. In the second post you will learn about framing, perspective, space, balance, and color. If I were you I would highlight, bookmark or favorite these posts. When you feel like your photography is getting a little “boring” take a look and refresh your memory on some good ideas for changing up your photos. Ok. So we know what CMS is and why it’s important. Right? Profiles are simply look-up tables that describe the properties of a color space. They define the most saturated colors available in a color space; i.e. the bluest blue or deepest black your printer can produce. If you don’t have a profile, the trio of Red, Green, and Blue values (or CMYK) that make up a color have no particular meaning — you can say something is blue, but not exactly which shade of blue. Accurate profiles are the key to a color managed workflow. With accurate monitor and printer profiles, your prints will closely match what you see on your monitor. Without profiles, you need to rely on trial and error combined with good old-fashioned guessing [via DryCreek Photo]. So in order to actually see the colors as they truly should be and not simply guess what they should be we start by profiling the monitor. Only then can we be sure that what we see really looks the way we think it does. Outback Digital Photo has more to say on the subject of Hardware Monitor Calibration Systems. Their site is definitely work checking out if you are in the market for a new calibration system. One thing I do want to note however is that I have heard that suction cups can be damaging on LCD monitors when they are removed. I have noticed that the new Pantone Huey is receiving wide popularity. I purchased one some time back when they first came out and was disappointed because of the suction cups. I merely took a razor blade and cut the cups off and now I have to hold the sensor to the screen when it is time for calibration. I notice no difference in the system with this little change. I simply make this note to readers to beware when purchasing for CRT screens as opposed to LCD screens. Now that the monitor is calibrated and profiled you send something to print and…does the printer output match the monitor output? If not, we’ll try and tackle printer profiles in Part III. Do these words bother anyone other than me? Color Management. This term can be so nebulous as to be confused with color calibration, color profiling or perhaps include both and all of the above. So for the next couple of days I’d like to devote some time to a discussion of color management. My first visit is to wikipedia–the www encyclopedia of the world. I went to first find out what a working definition of color management is. In digital imaging systems, color management is the controlled conversion between the colors of various color devices, such as scanners, digital cameras, monitors, TV screens, film printers, printers, offset presses, and corresponding media. The primary goal of color management is to obtain a good match across color devices; for example, a video which should appear the same color on a computer LCD monitor, a plasma TV screen, and on a printed frame of video. Color management helps to achieve the same appearance on all of these devices, provided the devices are capable of delivering the needed color intensities (via wikipedia). …they consist of three core elements: an engine that transforms color contained in images and documents, device profiles that represent the color capabilities of a printer, monitor, scanner, or camera, and an interface that allows users or applications to utilize and manage the capabilities of the system (via Digital Outback Photo). In many ways, communication in color has problems similar to those with communication in languages. Each device is like a person, speaking his or her own language. When one person that speaks French attempts to communicate with another person that speaks Japanese, there is a breakdown, and the message is not communicated accurately, if at all. What’s needed is an interpreter that is capable of interpreting the language as well as the dialect, to ensure that the message is properly communicated. The same holds true for color reproduction (via Digital Outback Photo). Now as far as “languages” go, most monitors and cameras “speak” in red, green, and blue (RGB), while printers and scanners are bilingual and can “speak” RGB and cyan, magenta, yellow, and black (CMYK). Add to this the human eye which can see (“speak”) far more colors (millions) than any device on today’s market. So we begin to notice problems when the colors seen on our display are much brighter and more saturated than the color that comes out on the printer. The reason for this is likely that the the color on the display is in gamut for the display, but is not in gamut for the printer. Let’s say for instance you want to represent the purest red you can possibly get. In that case you’re probably thinking about red that in Photoshop RGB is notated as R-255, G=0, B=0. This purest red will visually look different depending on whether you are viewing it via a scanner, a CRT-monitor, a LCD-monitor, a digital camera, or a printer. In this case, the color is said to be device dependent–the desired appearance of color depends on its being reproduced on a particular device. Several different factors determine which color is substituted for the original color, better known as gamut mapping. Another challenge exists in the method that desktop devices communicate with each other. It’s typical to have a camera, display and printer from three different manufacturers, as well as image manipulation and page layout software from different software vendors. But none of these devices communicate in the same language of color, and many handle color differently–much like the example of human speech. Color management systems link these disparate pieces together, and attempt to provide a consistent way for devices and applications to interpret color data. The characterization of a device is also called ‘profiling.’ Modern operating systems and imaging editing applications use the International Color Consortium’s (ICC) color management model that has ICC colour profiles at its core. Profiles that are custom-created for the device at hand tell applications how to compensate for the specific interpretation of each color by the device. Most manufacturers of monitors, scanners and printers deliver standard profiles with their devices. We’ll discuss color profiles in Part II. Layers offers Four Methods to Remove Colorcast. You may recall an earlier post on Color Correction. In that post, it appears I have essentially combined methods two and three. This brings up the question, and now I’ll have to give it a try…Can the same (or similar) results be obtained by doing just step 2, just step 3 or steps 2 and 3 combined. Let’s see? 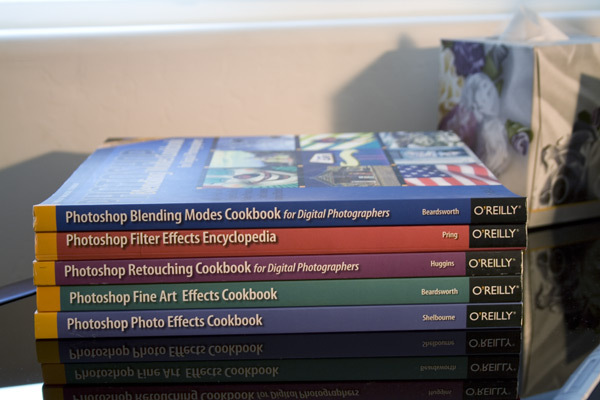 I’m going to give it a try on a photo of my new books I received in the mail last night. Yep, these are the ones I WON for free ($150 value not including shipping and handling)!!! They are fantastic. It looks to me like the original was too warm. Correcting just the shadows and highlights left the photo warm and washed out the colors a little. Correcting with the 50% gray finally made the photo cooler. When correcting all three, there appears to be that color fading again. It’s a matter of preference, but for me, I see no reason to correct anything but the gray. I prefer the third image and would just do a little tweeking on the curves to bring back some of the color saturation. You be the judge. For those of you who want to go out and spend $60 or more on a Color Card as suggested in Method #4, Gretag Macbeth will be happy to take your money. Or you could go with just a 50% gray card for a fraction of that cost. Just because a professional photographer uses a professional camera does not necessarily mean his pictures are ready for publication. Photo color correction can be a very significant part of photo editing for a website’s total visual impact, and yet it is usually neglected by webmasters and companies publishing content online. Realizing there are a number of ways to perform color correction in Photoshop, I’ve found that if you want to take control of your photo and not use the “Auto” features so much, a good approach, although perhaps timeconsuming if you have lots of photos to correct, is to use the Adjustment Layers and Curves. First you set the eyedropper tool to 3×3 average. Then you set the curves color picker to neutral values. Instead of using a pure black (0,0,0) for the shadow eyedropper enter 8,8,8. Instead of using a pure white (255,255,255) for the highlight eyedropper enter 244,244,244. This will set the midtone eyedropper to 128,128,128. You find the shadows by using a Threshold Layer and sliding the slider to the left until the image is completely white. Then you come back to the right until the first dark areas appear, these are the darkest areas. Click OK and use the color sampler tool to mark the area. To find the highlights you double click the Threshold layer to bring the slider back up and move it to the right until the image is black. Come back to the left until the first whites appear. These are the highlights. Click OK and use the color sampler to mark the area. After this you can delete the Threshold layer by dragging it to the trashcan in the layer pallet. To find the midtones you will create a new layer and fill it with 50% gray. Change the blend mode on that layer to Difference. Create a Threshold layer and slide the slider to the left until the image is completely white. Come back to the right until the first dark areas appear. These are the midtones. Click OK and use the color sampler tool to mark the area. Now you can delete the Threshold and Gray layer by dragging them to the trash can in the layer pallet. To set the shadow, highlights and midtones, you will open the Curves window and use the eyedropper by clicking on the first color sampler in the shadow area, clicking on the color sampler that shows the highlight area of the image, and clicking on the color sampler that shows the midtone area of the image. Finally, you can tweak the curve to your desired preference.